UPDATED: Thu., Feb. 2, 2017, 9:43 p.m.
BOISE – Reluctant Idaho lawmakers agreed to forward a bill outlawing electronic pull-tab machines that bring $3 million in profit to the state lottery each year. A group called Stop Predatory Gambling argued to members of the House State Affairs Committee that the machines represent a “slippery slope,” opening the door to the spread of gambling in the state and the destruction of families and lives. What’s more, the machines allow rapid-fire betting – as quickly as slot machines, said Jonathan Krutz, of the anti-gambling group. “The difference between paper pull-tabs and these touch-tab machines is the difference between caffeine and cocaine,” Krutz said. But Idaho Lottery Director Jeff Anderson disputed that characterization, saying the machines collected an average of $7.03 per hour in bets last year. And the money raised by them went to public schools and the state’s permanent building fund, with another $2 million in commissions going to the businesses hosting the machines. The committee voted 10-5 to forward the bill to the full House, but made no recommendation to fellow legislators on how they should vote. 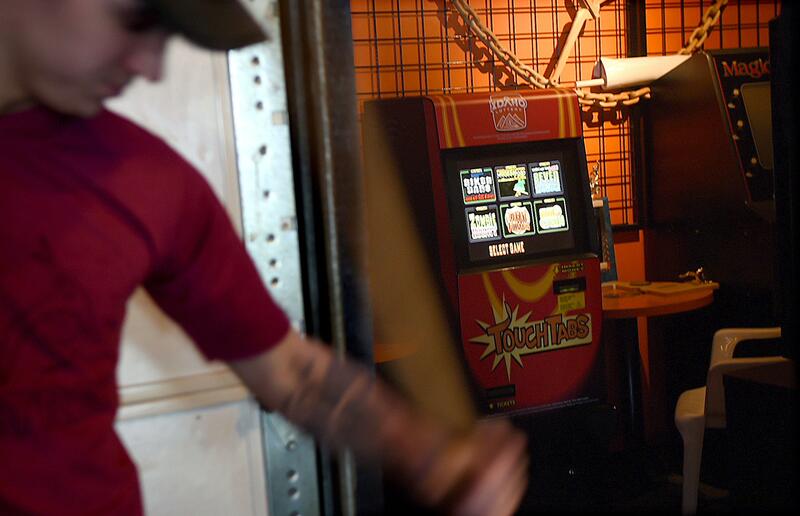 Lawmakers approved the machines in a pilot project in 2011; now they’re found in 144 bars or taverns around the state. Unlike traditional slot machines, the electronic pull-tab machines don’t have spinning reels, flashing lights, or bells and whistles, and they don’t accept coins. Lt. Charles Ketchum, of the Idaho State Police’s Alcohol Beverage Control Bureau, told the lawmakers he’s never had a complaint about the machines. Rep. Vito Barbieri, R-Dalton Gardens, asked the bill’s lead sponsor if it would satisfy his concerns to limit how fast the machines can be operated. The answer from Rep. Steven Harris, R-Meridian, was no. The machine, by its nature, “allows us to cross a threshold to I don’t know what next,” Harris said. Barbieri voted against the bill. When the hearing ended and it was time for the committee to vote on the bill, there was a pause; no member appeared to want to make a motion. Then substitute Rep. Eva Nye, who is filling in for Rep. Elaine Smith, D-Pocatello, moved to hold the bill in committee, killing it, but that motion died on a 6-9 vote. Eventually the motion was made to send the bill to the full House without recommendation, and it passed 10-5. Published: Feb. 2, 2017, 3:01 p.m. Updated: Feb. 2, 2017, 9:43 p.m.